In the farm fields of Lebanon's Bekaa Valley, the start of a harvest that not even war could stop offers hope for farmers facing a time of crisis. Driven from their headquarters in Syria's Aleppo province, the work continues of a group of scientists and farmers who store and grow crops with a view to helping feed nations. The work of experts at the International Center for Agricultural Research in the Dry Areas (ICARDA) is global, but many harbor the personal hope their efforts will help rebuild the country they left behind. 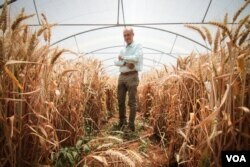 In ICARDA's Lebanon base, Ali Shehadeh fondly scrolls through pictures on his laptop of the old HQ, from the seed bank where samples of crops such as wheat, barley and chickpeas were preserved to the fields in which they were grown. Spread out across 1,000 hectares, the site represented a vast archive of the country's agricultural past and present, as well as a treasure trove for farmers worldwide. This includes 150,000 seed samples stored and ready to be grown or distributed across the globe, with each sample potentially holding genetic traits that could help develop crops better suited to survival in an age of rapidly changing conditions. "We try to figure out how to produce crops better adapted to climate change," explained Shehadeh, originally from Idlib. Before the war, their work had played a role in helping Syria reach the point of producing enough to feed itself, but the same war that destroyed that self-sufficiency also drove them out. Shehadeh scrolls onto the most recent pictures they have — images of damaged buildings now inaccessible because of militias operating in the region. The worsening of conditions — including the kidnapping of two staff members, who were released a few weeks later — lead to the ICARDA shifting its operations out of the country. "It was sad, of course," said Shehadeh. "We left behind a lot of memories and valuable resources." All, however, was not lost. With troubles brewing in 2012, the ICARDA team was prompted to copy most of the samples and send them to Svalbard, an ultra-secure "doomsday" global seed vault dug into a snow-steeped mountain on Norway's Arctic archipelago. Then, in 2015, they withdrew seeds from Svalbard to help rebuild the collection — this time in Lebanon, as well as Morocco. This is the fifth harvest collected at Terbol, a small town in the Bekaa Valley and new home for ICARDA. With climate change beginning to be more keenly felt, the work of those like Mariana Yazbeck will be increasingly vital. Yazbeck is seed bank manager at the new site, and highlighted the role of the region in the birth of farming. "What we have here is the base for some of the most important crops responsible for feeding a large population in the heart of the fertile crescent, which is the cradle of agriculture," Yazbeck said. "Now, 10,000 years later, we've many problems facing our agricultural practice, whether diseases or environmental challenges, and the need to feed an ever-growing population." Though it may not be a direct result of climate change, the agricultural sector in Syria is in as dire need of assistance as any. According to a U.N. Food and Agriculture Organization assessment last year on the impact of the war, damage to the sector totaled $16 billion. Whether due to damage to infrastructure or displacement of farmers, there has been a "huge" decrease in production, said FAO representative Adam Yao. "To rebuild the agricultural sector, there will need to be a major rethink of Syria's whole agricultural policy," he added, stating that ICARDA's expertise could have a "key role" in this. Though largely abandoned, the ICARDA center in Aleppo is not entirely out of action — it is thought the seed bank freezer continues to work unattended. And for many at ICARDA's Bekaa facilities, when peace comes and brings with it the opportunity for the organization to return to Syria, the desire to assist will not just be professional — it will be personal. The farm of Muhammed Amer Jnedan's family, located in a small village outside Aleppo, is currently occupied by a man from a local militia. But in his work with ICARDA, Jnedan is determined that he will put his knowledge to use, starting with home. "Maybe it is kind of dreaming," he said, "but I am still thinking to get back to my village. I want to put [to use] this experience I gathered or I obtained in the last 10 years."